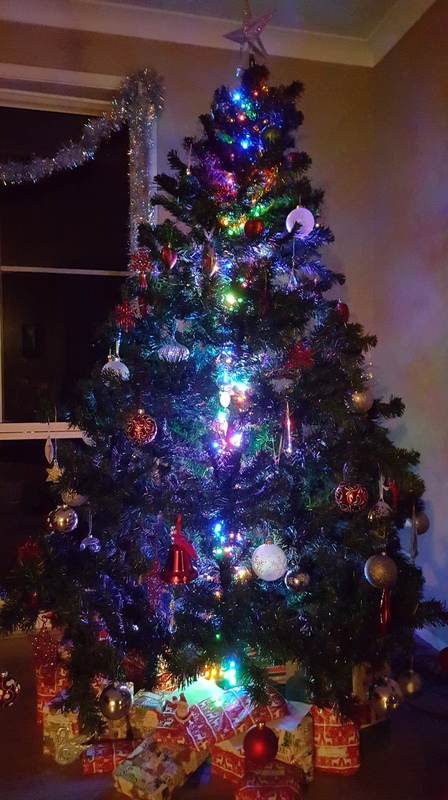 Here’s my Christmas tree… all the way from Down Under to be part of Colleen at Silver Threading’s Christmas Trees Around the World. Having put the tree together, he who is now a young man highly attuned to what is trendy and/or unique, decided hanging the lights vertically or around the outer edge of the tree was passé. And so with adoring sister, they came up with this. I am still not convinced… 🙂 Think a new trend will catch on? Thanks! I’ll pass the message on to the young man ☺. Merry Xmas, Florence and family. It sure looks different! Quirky.. that’s my kids. 🙂 Merry Christmas, Olga! Hope you have a loving and fulfilling Christmas. Thank you, Colleen. Wishing you and yours a restful holiday season filled with much joy and love!